Trying your best to get the best discounts on all Samsung ML-2525W laser toners? With Cartridge Save you cannot get it wrong when it comes to bargain Samsung printer toner cartridges. When ordering with us, you'll not have to waste time browsing about locally for what you'll need. If you want to get the cheapest discounts and the leading shopping experience, pick Cartridge Save! Purchasing from Cartridge Save will help you to definitely economise and benefit from the best service currently available. Have comprehensive satisfaction when you buy replacement Samsung ML2525W toner with Cartridge Save because of our company's extensive money-back promise that is standard . We help you save you even more money on toner cartridges because everything for sale comes with 100% free delivery, almost always delivered the following working day! Save some money, buy right now with us! The Samsung ML-2525W is a wireless monochrome laser printer with excellent ink-saving capabilities that is the perfect choice for the home office. It's also a good option for the small office that only requires light printing duties, most of which is distributed internally. At 1,200 x 600 (effective) dpi, the Samsung ML-2525W offers extremely high-quality text, and it consistently achieves speeds up to 24 pages per minute. That's an excellent balance at this price point. The ML-2525W has a 360 MHz CPU, 64 MB of memory, USB 2.0 ports, built-in Ethernet, Wi-Fi, a 250-sheet capacity, Energy Star approval, and a monthly duty cycle of 12,000 pages. The Samsung ML-2525W toner printer is a rectangular box that is small, compact, lightweight, and has an all-black colour scheme. Because of its dimensions, it's perfect for that tiny dorm room or home office, and it's typically small enough to fit right on the desk with the rest of your computer. The ML-2525W's paper tray is positioned at the front and easily accessible. The output feed is up top and well designed. Also on the top is a minimalist control panel that has a handful of buttons and some indicator lights. There is nothing externally different about the ML-2525 compared to the ML-2525W. The ML-2525 simply lacks Ethernet and Wi-Fi, and must connect to the computer via USB. 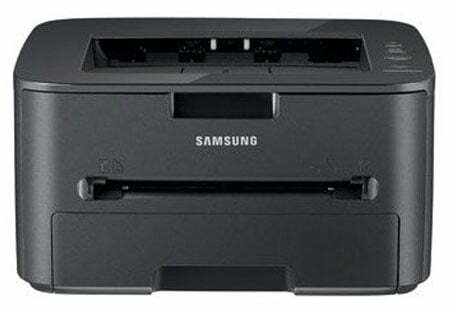 Access to the Samsung ML-2525W printer cartridge is easy and requires no extra tools. The Samsung ML-2525W is simply a tremendous printer for home users that delivers all the text quality, speed and reliability you can expect without diving into high-priced business machines. This machine is also reasonably quiet, has an excellent ink-saving mechanism, and uses low power while operating and especially in its idle state. Samsung gears the ML-2525W toward the Windows user, and in that regard, the unit really shines. The printer is plug-and-play, extremely user-friendly, and it includes a wide range of high-quality software, including AnyWeb, which is handy for printing webpages. One main disadvantage is the lack of colour, and even the black and white photo printing on this machine leaves a lot to be desired. Of course, that's not what Samsung intends the machine for, but they do market it at a segment where the colour photo printer is king.